The first installment in my series on ideas for reconnecting Chicago with its natural expanded region in the Midwest focused on what could be enabled by linking Milwaukee and Indianapolis to Chicago via high speed rail. This makes it a good time to talk about Midwest high speed rail generally. There’s been a lot of talk in recent years about the idea of creating a Midwest high speed rail network. 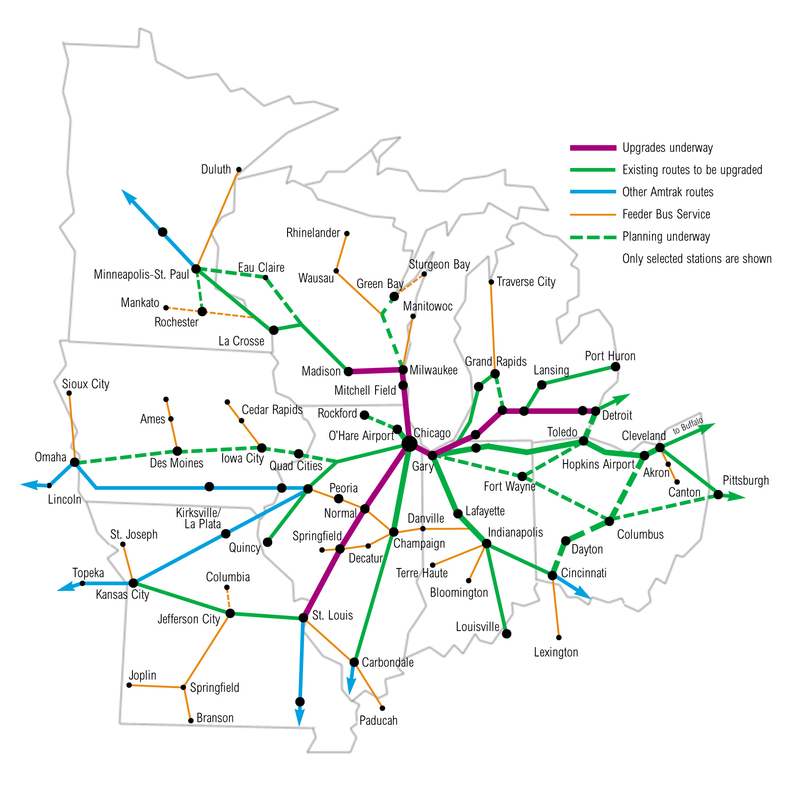 The federal government has already designated a system of Midwest rail corridors. There’s a lobbying organization pushing it called the Midwest High Speed Rail Association. A host of environmental groups support it. I even had a (successful) mini-effort to get Louisville included in the Midwest network. High speed rail is an area, like transit generally, where it is almost impossible to get information that does not come from some type of policy advocacy point of view. Consider the MWHSRA. I like these guys and am on their list, but they are a lobbying group for high speed rail. I think it is fair to say you’re never going to get a discouraging word about rail out of them. Their job is to gin up reasons to do rail. Unlike with local rail transit systems, where there is often significant opposition rooted in tax policy, I don’t see a lot of organized opposition to high speed rail. But there seems to be a lot of indifference and dismissiveness on the part of many. “We’re not Europe” seems to be the easiest way to sum it up. I think there could be a case for high speed rail, but I think the arguments in favor of it have been way too simplistic to date. The benefits seem to be assumed rather than demonstrated. It is treated as a self evident good backed up by only rather generic arguments and appeals. I think we’ve got to get beyond this, and start asking the hard questions. Because it’s not just about running trains, it’s about what it can do for us. There are the fast trains along the Boston/New York/Washington corridor that have allowed Washington, in effect, to become a commuter suburb of greater New York. But how about a place like Detroit? If Detroit were better connected to Chicago, one could imagine Detroit having a better reason for existing. Could we? I’m having trouble imaging it. Better connections to Chicago by rail will give Detroit a reason to exist? I wish Florida had helped imagine it for us. Who is going to ride those trains back and forth? Is it new trips or displaced air/auto travel? Why are they going back and forth? How many of them will there be? What is this going to enable us to do that we couldn’t do before? Those are the questions we need to answer. The rationale in Europe is often about replacing air on short distance, high density travel corridors with rail for environmental reasons. It isn’t about giving Paris and London, or Madrid and Barcelona, reasons to exist. But the problem with the Midwest is that far too much of it is slowly dying economically and hasn’t adapted to the global economy. How does rail help with that? What is going to be different after we build the network? Benefits we know about that we can reasonably expect to achieve if we execute right. There’s no guarantee, but at least we’ve got a plausible business case. Benefits we don’t know about yet. This is based on the idea of emergent properties of a new transport infrastructure. We’ve seen this before with, for example, the internet. We can’t predict what new things it will be leveraged for, but we know it is a disruptive technology. I think we’ve got to hang our hat on the first point. There may in fact be benefits we can’t anticipate. But that sword cuts both ways. Again, we’ve seen this movie before. The interstate highway system had benefits beyond what we ever dreamed for it. But it came with a lot of downside too. Similarly, the internet has generated huge benefits for some, but has also been an enabler of offshoring that put a lot of people out of work. I think it’s fair to say that whatever good things come out of rail, there will probably be some nasty surprises we didn’t anticipate. Again, to follow-up on a previous post, we have to be careful not to decontextualize the solution. Rail has worked in places like Europe and Asia, but the conditions in the United States are very different. What’s more, Europe and Asia have had very different policy objectives and implementation approaches than what we’ve seen in the United States. Are those transplantable here? Certainly they would not appeal to large segments of the American community. No doubt many people would like to see us adopt more Euro-like policies. That’s totally legitimate. But let’s be clear on the basis of the debate. It’s a debate about policy and values, not about technology. And indeed often the debate over things like high speed rail is really just a proxy battle for deeper conflicts of values that we don’t want to talk about openly. It’s always easier to try to justify our position based on purportedly technical criteria rather than to make our case for why our goals and objectives are good in and of themselves. That, however, is the discussion that we need to have. Even looking purely technically, is it reasonable to assumed the same results for our system as for Europe’s when the operating characteristics and technology are proposed to be radically different? It seems dubious. I think I’ve put my own cards on the table. To me, the goal is economic growth for our cities, and helping them to achieve success and broad based prosperity in a 21st century economy that will be very different from the 20th. I do support goals like improving the environment and having a more sustainable society. But I also fundamentally believe that people tend to act in their own self-interest, that only a limited number of people are going to ride trains or do anything else simply because it is “the right thing to do” and that people are going to choose their mode of transportation based on the optimum blend of price, end to end journey time, and quality of experience that fits their needs. So we should look to justify rail based on tangible economic benefits we hope to achieve, sustainable competitive advantage we can create with it, and solid mobility based reasons people will ride it. I think it’s going to take a lot of hard thinking and serious research to get there. I did try to offer two examples of where rail would accomplish this with regards to linking Chicago to Milwaukee and Indianapolis – the labor force benefits and the sub-division of labor benefits. Both of these potentially offer sustainable competitive advantage. That’s possibly the lever that is most important. It’s not just whether or not you can convince someone to take a train instead of a plane or auto. It’s about what you can do with rail that you could never do before – things that other cities and regions can’t match. You see here a vast network envisioned. High speed trains, slow speed trains, bus, local transit, street cars, regional rail, national rail, overnight rail – the MWHSRA is in favor of all of them. Immediately you see the political nature of such a construct and the key challenge to ever implementing something that achieves real benefits. Amtrak survives today because it maximizes the number of states and Congressional districts in which it offers service. You see the same logic at work here. Every state and every region within every state would receive some type of service. Parochial interests of little real significance – such as a high speed rail line from Chicago to the small southern Illinois city of Carbondale – are included as part of a throw stuff at the wall and see what sticks strategy. Truthfully, it’s difficult to see how you make progress other than by taking such an approach. But it is hard to envision capturing the real benefits here. The types of benefits that can be achieved will vary greatly by city pairs. And of course larger cities will benefit much more than small cities. But there isn’t much political logic in that. Let’s look at a few specifics of this plan. 1. The Chicago hub. This network shows Chicago as the hub. That of course, is logical. But a hub has multiple meanings. I think what comes to mind for most people is an analogy to an airline hub. Airline hubs are principally about interconnects. That is, rather than a mesh of point to point lines, you fly everyone to a central location, have them switch planes, then fly to the destination. This is very efficient which is why companies like FedEx and UPS make such heavy use of it for freight. But is most high speed rail traffic likely to be beyond service via Chicago? It seems unlikely to me. I’ll be the first to admit that I haven’t thoroughly investigated the numbers – hey, it’s a blog, not a journal article – but if I look around the world, I see rail primarily being used as a point to point technology in major, high density transit corridors. It also links peripheral cities to a national capital or primate city type of arrangement. While there is some interconnect traffic, I don’t believe that is the basis of justification for the route. My belief is that, in practice, the vast majority of trips on any Midwest high speed rail system are likely to be point to point O&D to Chicago. 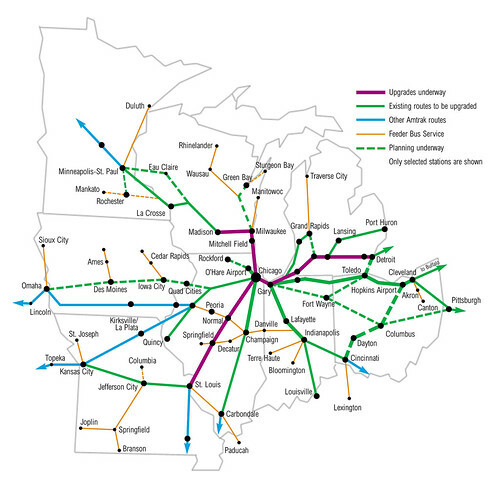 If you are traveling from Detroit to Minneapolis, are you likely to endure a multi-hour rail journey to Chicago, transfer, and take another multi-hour train to Minneapolis? There’s probably some of this, especially novelty, leisure, and perhaps student type travel. But most serious travelers are going to hop the one hour non-stop flight. We need to view the high speed rail network not primarily as about anywhere to anywhere hub and spoke through Chicago, but rather as a series of city pair links to Chicago. One implication of this model is that it eliminates the need to terminate all traffic at Chicago Union Station, which is a benefit I’ll explain later. You can instead choose the most appropriate station to use for each route. What’s more, this implies that we should study each route separately, to identify the pros and cons and specifics of each in terms of the benefits, technologies, etc. There is no one size fits all solution here. This approach also means that we should not be relying on amorphous “network benefits” via analogy from the internet. If we can come up with some specific cases, great. Otherwise, to me that is gravy. I believe it is theoretically possible to justify point to point links without regards to this. Of course, it might also mean that some city pairs don’t make sense. That hurts the case politically, but since I’m not a marketing program for high speed rail, I’m free to ignore that for now. 2. Confusion of the solution and the problem. The MWHSRA supports using corridor appropriate technology, which is right in line with the above. But what this means in practice is that for the routes shown in purple and in green, existing railroad tracks would be upgraded to support 110MPH, non-electrified service on lines shared with freight. Why did they pick this? There are a few good reasons. One, 110MPH service is the fastest the Federal Railroad Administration (FRA) allows you to go and still maintain grade crossings. Two, this, along with using traditional technology, dramatically reduces the cost of the network. Previously, it was said that this network could be constructed for a little as $1 million per mile. That’s clearly a joke, and I haven’t seen that number in a while, but it is undeniable that this is a much more affordable system than say a Spanish AVE-style system operating at 200MPH. Three, it lends itself to incremental implementation over time, something that I have long supported in many other areas. A lot of times “big bang” just isn’t reasonable. Incremental deployment reduces risk and gives you speed to value, which can give it a huge surface appeal in this case. So it is very hard to fault the MWHSRA for taking this approach and clearly it is completely valid type solution and probably the more realistic way to get something implemented. I do not think it is the right one however. Why? Fundamentally because it confuses the system with the benefits. The idea seems to be that we want high speed rail, so however we have to define high speed rail or however we have to structure deployment of the system to get there is the way we should go. But the scope shouldn’t be the network. The scope should be the benefits. It’s about the benefits and what we need to do to get them. And I don’t believe that this 110MPH network satisfies the objectives of the system as I defined them because the journey times will simply be too long. Let’s look at some of the high density lines in Europe where we have seen the greatest displacement of air travel with rail. Paris to London via Eurostar is 2:15. Madrid to Barcelona via AVE is 2:35. Virtually no city in the proposed Midwest system will have times like this other than Milwaukee and Indy. St. Louis and Detroit are both about 300 miles from Chicago. With slower speed terminal approaches, there is no way you are going to get less than 3.5 hours on these lines, probably worse. With collection and distribution times on the end, is this going to be competitive with air travel? What’s more, even if you could displace air travel, what does that give you? Again, what does a 3.5 hour rail service let you do that you couldn’t do before? How does it change the game? Even if environmental benefits are your driver, it isn’t clear to me that you’d reduce flights materially. There are still going to be plenty of Chicago-Detroit and Chicago-St. Louis flights because of the hub-spoke design of the air system. It’s not even clear that it is auto-competitive, when you factor in journey times to and from the station, plus the early arrival buffer you’ll need to leave on your journey. Again, the drive time is much closer to the true door to door time than the flight or train time only is to the journey times for those modes. The present plans being pushed envisions a five hour train trip from St. Louis to Chicago. But if that’s what you want, there’s already a service that will give it to you. It’s called Megabus, it leaves from the exact same place as trains, it’s dirt cheap, very popular, offers wi-fi service, and even better is provided 100% by the private sector – no tax subsidies required. If Megabus isn’t a game changer in the relationship between St. Louis and Chicago, why would an equivalent rail service be? Also, I don’t think full consideration has been given to what this means practically. Most existing freight/Amtrak lines run through lots of towns that grew up along the rails. How many of those towns are going to be excited about super-fast trains barreling through at 110MPH, particularly if they don’t stop there? Inevitably, routings are going to be chosen to maximize the number of cities served and/or there will be compromises to speed that hamstring the routes. Small town and rural legislators are very influential in Midwest state houses. At a minimum, there’s going to be a lot of compensating going on. So as someone who’s been noted as a rail skeptic, I’m coming to a rather surprising conclusion, namely that the proposed Midwest high speed rail system is not nearly ambitious enough. I think it occupies that unfortunate gap between a cheap solution that gives amazing price/value and an expensive solution that is a total game changer. I think it’s still a pretty expensive solution, but one that, even if it attracts riders, isn’t going to move the needle in terms of making the Midwest more competitive and successful. Again, my belief: the scope is the benefits and you have to design a solution to obtain them. Then you can decide if you think the ROI is there. Conduct city-pair analysis of every major (one million plus population MSA) city with Chicago, with secondary screening studies of surrounding cities. Selected other cities could be selected where we have reason to believe there might be some benefits. Based on this, define a plausible set of mutually beneficial results that we think we can obtain as well as a rough cut on the technology and cost. If it makes sense, proceed to a detailed planning study. My hunch? In most cases, if we want to accomplish something meaningful, it involves significantly higher level of service than envisioned in the current proposals. I also think there are disproportionate benefits to cities that are closer to Chicago. This means #1 Milwaukee, which is already starting to function as a sort of part of the Chicago economy. And #2 Indianapolis, which is by a good margin the next closest major city. Then you get into ring three – Detroit, Cleveland, Columbus, Cincinnati, St. Louis. I’ve already made the case for both Milwaukee and Indianapolis. Again, read it here if you didn’t already. It’s based on an extended labor force model and enhanced hierarchical subdivision of labor. Here are some characteristics of such a system as well as some praticalities that would need to be addressed in order to have any chance of success. Keep in mind what attracts riders to the system: competitiveness in terms of cost, end to end journey time, and quality of experience. 1. We need game changing reductions in rail journey time. Especially given the collection and distribution time requirements on each end, I don’t see how we materially enable anything different if we aren’t making major journey time reductions. That’s why I proposed the 90 minute trip target for Chicago-Indy. 2. The system must operate with absolute reliability. You should be able to set your watch to this thing. In Spain, the high speed rail network promises arrival within 5 minutes of the scheduled time or your fare is refunded. The system only pays out on 0.16% of trips. That’s what’s needed here. Clearly, that’s a far cry from Amtrak. 3. Quality of experience must be top notch. This doesn’t necessarily mean spending a lot of money, but it does mean more than bare bones. It’s about being very rider focused and adopting a hospitality industry type mindset. The trains themselves should be of top notch design and quality. There should be AC power and wi-fi throughout – free. There should be quality on board services. The staff need to be extensively trained in customer service. The check-in process should be totally painless – and preferably electronic. The web site and other electronic communications channels should be state of the art. Stations need to be welcoming, comfortable, well lit, with excellent signage, etc. Again, architecture and design matter. 4. You need to solve the collection and distribution problem. This is already largely solved through public transport and taxi service in Chicago. Other cities have much worse systems and will probably need to upgrade them. Most cities with successful high speed rail service also have excellent ground transport once you arrive. However, it’s not realistic to expect everyone to take transit, so rental car facilities should be included at the station with very easy access. 5. Price to entice. The price equation has to be there to deliver the value. At one point at least it was claimed the Midwest system would break even operationally. I don’t believe this, nor do I believe we should set it as deal breaker system goal. I believe some level of operating subsidy would be required, just like with most transit systems. 6. Frequency of service. If you can’t offer good frequencies, again, how much of a game changer can it be? I’d say something like hourly service would be preferred, including at least one late night train for people departing after attending an evening event. The lack of train frequency is a big limitation, for example, on the existing Hiawatha service to Milwaukee. 7. Amtrak is not the answer. Most rail proposal assume Amtrak is the operator. I think this would be a big mistake. Amtrak’s brand in most places is terrible and the politics around it have been poisoned. Why would we want to saddle our brand new state of the art high speed rail system with Amtrak’s old school operating practices, antiquated work rules, and legacy costs like retiree pensions? Let’s start de novo on this one. We don’t need to just change technology. We need to change the whole culture around rail operations. 8. Top notch, non-intrusive security. High speed rail is a terrorism target. We certainly don’t want an Atocha situation here. On the other hand, the “TSA experience” would horribly compromise the attractiveness of the system. We’ve got to get creative here. 9. To repeat again, a high speed rail system can’t be positioned simply as an environmentally friendly substitute for what we already do today. It has to be something that let’s us do things we couldn’t do before, or that give us game changing elements of sustainable regional competitive advantage. I would also propose a series of federal policy changes and actions to make this a reality. 1. Funding. There is no way that states and local governments are going to be able to pay for this, so it has to be a majority federally funded program. Beyond initial capital, we’d need a dedicated funding stream for operations and for capital refresh so that we don’t end up with an infrastructure crisis as the system ages and there is no money for maintenance. Take a look at our major urban transit systems and see where that approach leads. 2. Proper positioning as a major urban service. We need to treat high speed rail like major airports. Not every town has an airport with commercial service. Only large cities have that. Similarly, high speed rail is for large urban centers and perhaps a very limited number of places in between. While politically difficult, we’ve got to be realistic about this. I don’t advocate ignoring smaller towns and rural communities. Far from it. I think communities adversely affected by rail should be compensated. And I also think we need to be creating policies that are tailored to the unique needs of those places. Our country isn’t all the same and we can’t have a one size fits all policy. 3. Mandate more flexibility at the FRA. Our rail rules are among the strictest in the world and are hostile to passenger service. We’ve got to have leadership in place there that will adopt a “can do” approach. For example, we should have maximum flexibility to run light European style trainsets without having 100% dedicated trackage. Perhaps President Obama could establish a high speed rail program within the Office of Urban Affairs to ride herd on the FRA and make sure regulatory red tape doesn’t kill the program. 4. Expedited environmental review. Speaking of which, the NEPA process is a good thing. But we’ve got to strike a better balance where we don’t drown major infrastructure investments in a decade plus of studies to tell us more or less what we already know. Yes, by all means let’s do environmental studies. But let’s make sure high speed rail is put on a fast track. Next, I’ll turn to some thoughts on the first two connections I proposed: Chicago-Milwaukee and Chicago-Indianapolis. A commenter, the Urban Politician, noted that Indiana had no political demand for high speed rail and accused me of showing favoritism to Indy. Well, I do admit to having a soft spot for Indy. However, this is a legitimate objecdtion that I think needs to be directly addressed. First, I believe we need to figure out how to create political demand behind the routes that make sense, not rely on progressing randomly on projects of unknown quality just because there’s some people who like them. Indianapolis is the second closest city to Chicago other than Milwaukee by a good margin. This makes the case for rail service between those cities extremely strong. Indeed, if you can get the trip time to 90 minutes, you start to see some very interesting opportunities for game changing interaction. But TUP is right, there is no political demand in Indiana for high speed rail. I think this can and should be changed. Indiana has a reputation for conservatism, but it is actually on the leading edge of practice in many respects. Major Moves was a very creative way to fund the highway program and only a few places have done anything like it. Indianapolis is the national leader in modern roundabouts. Carmel alone has 50, which is 5% of the entire US total. And the roundabout interchange project on Keystone Ave. is the first time that approach has been done at that scale anywhere in the country. The new Indianapolis airport is the all around best in the country, and the most environmentally friendly in the world. The Indy Cultural Trail is re-imagining the pedestrian and bicycle experience in a downtown. So I think there’s reason to believe Hoosiers could get behind it – if there’s a compelling reason to. I think I laid out the case for the potential economic development benefits. But there is one other argument for it that is an absolute no brainer. There is $9 billion for high speed rail in the stimulus and Indiana isn’t getting any of it because it has nothing to spend any of it on. I think it’s fair to say the taxes Hoosiers pay aren’t going to go down just because the feds are spending the high speed rail money places besides Indiana. This isn’t about pumping huge amounts of money into a grandiose scheme. Rather, it’s about spending a relatively small amount of money to do planning studies and environmental work, and building consensus around a solution that can be implemented. In effect, it’s about buying a very cheap out of the money call option. If high speed rail takes off or there are major federal dollars behind it, the state is positioned to succeed. If not, not much is lost. But if high speed rail does take off and the state isn’t in the game because it didn’t pay the ante, that’s not a good place to be. So I think this makes sense for Indiana even based on a hard nosed dollars and cents view. Plus, I think there is reason to believe that this route has more going for it than you might think. Chicago and Indianapolis have the two strongest civic sectors in the Midwest by a mile. Chicago is united by the strong leadership from Mayor Daley. If he says this is important, people will rally behind it. In Indianapolis, it can take the community leadership a while to come to consensus about something, but once they do, watch out. Once the armada is in formation, Indianapolis is a city that almost invariably accomplishes what it sets out to do. And while you can get grand visions almost anyplace, if you want to get something done, call Mitch Daniels. The long overdue departure of Blago means the state of Illinois can finally start engaging seriously at the state level. And of course President Obama means there is a friend of Chicago in the White House. Lastly, one reason this route has gotten less attention is that there is no longer an existing high quality rail connection between Chicago and Indianapolis. The existing Amtrak routing is circuitous and horrible in its operations characteristics. This is in contrast to say Milwaukee where there is a already a 79MPH rated double-track line between the two cities. Given the MWHSRA approach of incremental improvements, focusing on cities where there is already a decent quality line in place makes sense. However, what others might see as a defect, I see as a positive. Look at my technical note for more. What would I propose doing? It is pretty simple. The respective governors and mayors would charter a feasibility study and tier one EIS for the corridor. This would also have top level sponsorship from President Obama’s Office of Urban Affairs as well as involvement from the FRA. This would include significant involvement from the business leadership of both cities to make sure the business case is there. This would be more than a typical technical study which looks at how you build something. Rather, it would be an open dialog about the future and what we want it to be. About the types of game changing things it could enable and the willingness of the respective business communities to invest in making them real. About building relationships and trust. I believe it would also look at a system that offered true high speed service with the attributes I laid out above. I think President Obama should fund this via discretionary transportation grants from the stimulus. Some technical thoughts on this route are below. Running in parallel with this would be a less detailed study looking at the connections from Indianapolis to Columbus, Cincinnati, and Louisville. This starts the process of determining if those corridors are worth it, and provides some information on potential through routing of traffic to Chicago. Actually, if there’s a logical hub in this system, meaning a traffic interchange point, then it is Indianapolis not Chicago. All traffic from the southeast should be aggregated in Indianapolis in order to proceed to Chicago. I’m not sure what the value basis of rail is to those cities, but that’s what we have to discover. One this initial work is completed, then the parties can decide if the ROI is worth it. For Milwaukee, the situation is a bit different. The Hiawatha service already offers a 90 minute journey time and is in regular use. Wisconsin has been very active in supporting high speed rail. Wisconsin has already invested in station upgrades on the Hiawatha line, so I’m sure the governor and mayor would be all in favor here. I’d suggest a similar effort to Indianapolis here to focus on how to use rail to drive economic growth and benefits, and to flesh out the technology a bit. But I think this one is more straightforward. This same approach would need to be taken with every city pair out there. Articulate the basis of value, find out what you have to do to get it, decide if there is a willingness to do so, and look at the ROI. Then make a decision and seek funding if it is a yes. I do believe as more cities are added there will be some “network effect” benefits, but I think in the short term we need to hang our hat on city pair logic. Finally, I’ll wrap up with some technical thoughts on the two lines. First, Chicago-Milwaukee. The 90 minute journey time is already pretty good. This is a route that I think, given the distance, is perfect for the incremental improvement to existing rail technology approach preferred by the MWHSRA. There are two things that need to be done. One is to reduce the journey time. I think it should be possible to get closer to 60 minutes than 90. The other imperative is to increase frequencies, preferably to hourly. And of course we need to absorb this into the new rail operator, so as not to rely on Amtrak and the subsidies that the state of Wisconsin is currently giving for operations. The easiest way to reduce journey time is to speed up the terminal approaches, which often feature several miles at low speeds. You get much more bang for your buck upgrading the segments close to the terminals than you do the already fast segments in the middle. Though I do think the middle segment north of Rondout probably could be upgraded to 110MPH operations fairly easily. The bigger challenge in frequencies. The Milwaukee Road line used by this service has well-patronized Metra service and is also used by freight trains. One problem is the A-2 interlocking where the Milwaukee Road trains cross the Union Pacific lines on the near west side at grade. It’s a serious bottleneck. Metra is well aware of the problems here and anything that improves this situation could also dramatically better commuter service. Other capacity constraints might be addressable via extended sidings or express tracks. But there’s no doubt this will be difficult. One other item. I believe the Glenview stop should be relocated to Lake-Cook Rd., where the Shuttle Bug service will connect it to the many area employers. On the Indianapolis line, I noted the lack of a quality existing connection between the cities. But as I’ve long said, invert the world. Turn your weakness into strength. In this case, the poor routing and condition of the current line more or less takes the inferior upgrade existing approach off the table. That means the answer is a new terrain route. I believe the best technology for this corridor would be a European style, 200MPH service along a new terrain routing for most of its length. This would use off the shelf, proven technology from the likes of Siemens. The Siemens trains are already working in Spain at the high service levels I mentioned previously. By all means have a bake-off on the vendor, but I would suggest that EMU versus a TGV-style separate power is better. The benefit of the new terrain route is that it enables dramatic increases in speed and service quality without any freight interference. Also, a new terrain route can bypass all the towns the existing lines pass through, so those Main Streets don’t have high speed trains blowing through them and all the attendant noise and danger and such. Northern Indiana is flat, which is deal for rail building. And the rural nature of the route means that the grade separations – which would be required – would be limited. Possibly “offsets” secured during the procurement process could mean a manufacturing plant and/or a US HQ operation locating in the corridor. There would be intermediate stops at Lafayette (possibly on the outskirts to avoid the urban construction issue) and Lake County (just south of Crown Point). The route could be single tracked with passing sidings or double tracked as the need warrants. Connections into Indianapolis and Chicago would use existing routes. In Indianapolis, there are two potential routings. There are two lines extending from downtown to the west, the double-tracked CSX Indianapolis Line to St. Louis (the one that parallels Rockville Rd), and the CSX Crawfordsville Sub, which is a bit south of there. The Crawfordsville Sub has a through track plus an industrial siding on the west side. Option A involves utilizing the Crawfordsville Sub to a point just beyond Brownsburg, where the new terrain segment would begin. This is an indirect routing, but it is a fairly short distance. It should support 70MPH operation. A single tracked approach is all that is needed. Some limited amount of track construction might need to be done. If the industrial siding could be upgraded, freight could be diverted to it, then the remaining segment to Brownsburg could be double tracked. Option B involves upgrading the Crawfordsville Sub, creating a better connection to the Indianapolis Line, then routing all freight traffic that way from the crossing point, possibly also utilizing an upgraded IU Belt around Indy which some local leaders have wanted anyway. Then the passenger service uses the Indianapolis Line tracks west to the Crawfordsville Sub crossing (near Country Club Rd), and uses a newly constructed second track along that route for a few miles to north of Brownsburg again. This completely eliminates freight interference. Again, true high speed operation isn’t needed close in to town. Why would CSX agree to this? Good question. Among other things, there is a project called CREATE that proposes spending $2.5 billion to relieve Chicago rail bottlenecks. This has a huge benefit to CSX. I think it is reasonable to ask for some cooperation on passenger rail in return for this large investment of public funds that benefits their network. Similar upgrades to the IU Belt in Indianapolis could be in play too. In Chicago, we take advantage of the fact that we are no longer treating the city as an interchange hub to avoid the messy route to Union Station and do something much simpler instead. We cut over on our new terrain route into Illinois and use the Illinois Central tracks into a downtown terminal at Millenium Station. Other possible terminals are a new showplace high speed terminal at Van Buren St. Station, or, if you get some impossibly large windfall, a connection into the mothballed Block 37 Superstation. The Illinois Central line is largely separate from the rest of the Chicago rail network, which means it does not have all of the crazy grade crossings and such that the CREATE program is designed to reduce. It’s just a straight shot into downtown, mostly already grade separated. Plus this might be the widest railroad ROW in town, with many mains. There are four already electrified mains for a good portion of the length, utilized by the Metra Electric service and the South Shore. It is easy to see how one of these could be given over exclusively to high speed operation, at least outside of rush hour, enabling a very rapid terminal approach. We have to connect, and the map looks like the logical way to do it is to turn west just south of Crown Point (hence our station), then connect with the Illinois Central around University Park. Probably there would need to be some near term movement to protect the corridor. Is this something the Illiana Expressway study could look at? If the Illiana included a rail corridor adjacent, that could be a winner. This is a bit of a detour, but at true high speed operation, not much of one. I do believe there are some rush hour slot problems north of Kensington where the South Shore connects. But the good news is that with hourly service, you only need to squeeze one or at most two trains through during each peak period. Otherwise, the four mains make this a breeze of a connection. I’m not going to say this is the right answer, only one answer that I think should be studied. It would require concessions on multi-mode intergration by the FRA and a host of other things. But if we looked at it with a “can do” attitude instead of a “can’t do”, I’m convinced there’s a way that could make it happen. The downside of this? A price tag that I’d estimate at $3-4 billion. That ain’t cheap. But that’s the going rate for real high speed service. There’s a legitimate question as to whether the benefit is worth it. Ultimately, that’s one of the questions of priorities and values we’d have to come to consensus on. Even with the feds picking up 80%, that’s still around $800 million in local matching funds for construction. On the other hand, the $9 billion just approved in the stimulus would have easily paid for this line. So it doesn’t seem unreasonable to think that a future Congress might fund it. Another problem with it might be the opposition of places that don’t get service to something that doesn’t benefit them. That’s totally understanable. That’s another reason we need mostly federal funding. Plus, we’ve got to make the case that it does benefit them indirectly. I’ll make that case myself in my next installment of this series. Again, this is an exploration around high speed rail. Not the answer. I hope it starts a dialog. Your feedback and contributions are welcomed and encouraged as always. When do you propose to start? Anon, could you name a single book that sold over 50,000 copies without being published by a trade publisher? Even 10,000 would be fine – the largest vanity publisher, PublishAmerica, can barely handle anything over 1,000, and topped at 5,200. Thundermutt, everything you say about highways is true in Europe and Japan, too. Remember Lyon’s paltry metro system. Nothing about the amount of auto dependence in Kentucky or Tennessee says that Chicago-Detroit HSR won’t be successful. Even Japan doesn’t have nearly the auto independence you think it has outside Tokyo and Osaka proper – Tokyo’s suburbs have an auto modal share on a par with large cities in the US Northeast, like Chicago and Philadelphia, rather than New York; and yet, the Tokaido Shinkansen is so profitable and congested that JR Central is designing a parallel maglev line to be funded purely out of the existing HSR profits. "Who is going to ride those trains back and forth? Is it new trips or displaced air/auto travel? " Uh, for Detroit it's all those people who live in Detroit and can't find jobs there — plus people who are priced out of housing in Chicago etc. and can buy a house for a dollar in Detroit. Simple really. Detroit-Chicago is a booming transportation opportunity. I find it almost impossible to have just read through this amazing comment section that not a single person has mentioned that by building HSR, there will likely be a reduced strain, or slowed growth, on highway traffic and airports. This will result in lower future costs of expanding Midwest airports and lower maintenance costs for highways as a result of either lower vehicle movements. So, in addition to all the potential benefits of reduced time between major centers, there will be a reduced future need to spend money upgrading the road and air infrastructure that exists today. Or is this just too obvious to mention? My thanks to Kyle for his post on the bleed-off from roads and airports. This whole mess is a bed-rock American issue – MONEY. We've burned through an enormous amount of cash in roughly a half century of spending on roads and airports. I would be afraid to read an HONEST report on historical spending on mobility (roads, rail, water, air) because the numbers might be enough to make me puke. Do NOT forget that one part of Uncle Sam's largesse covers canals, dams, and locks used by barges (Army Corps of Engineers). Passenger rail in this country has long been in the position of Oliver Twist – namely getting laughed at when asking for a second helping of slop. 3) Build rail corridors – seemingly expensive (until compared to roads/runways), minimal dirt, medium maintenance costs and eats some land that could be used for farms and parks. We do NOT have rail corridors at this time. What we have are pathetic excuses for corridors that are balkanized, archaic, and have a Paul Bunyan-sized piper handing us a bill for fifty (50) years of neglect. I think that the only out left to us is to follow the canal/dam/lock model and go federal. This is an interstate commerce issue since most of the links (other than Calif. and Texas) cross a state line or two. We've got a Gordian Knot and Uncle Sam needs to use a sword-pen on it. P.S. Why is Hong Kong's transit system the only profit making one in the world ? Because it isn't a transit system. It's a property management firm that offers transit services to its tenants. Now think back to our transcontinental railroads and how they were lured into their herculean labors. P.P.S. I've worked in the aviation field in a support role for a decade. I'm also a rail-fan who enjoys living in what amounts to the world's biggest railroad museum – the San Francisco Bay area and northern California (e.g. The Skunk and Roaring Camp ).